Abstract: In connection with the Hungarian radioactive waste disposal program a detailed study of the mass properties of the potential host rock (granite) has been carried out. Using the results of this study the various parameters (orientation, length, intensity, transmissivity, etc.) describing a fracture set were estimated on the basis of statistical considerations. These estimates served as basic input parameters for stochastic hydrogeological modelling of discrete fracture networks (DFN), which is a strongly developing area of hydrology, providing geologically realistic geometry for site investigations. The synthetic fracture systems generated were tested against some (but not all) field observations. The models built up on the basis of the statistical descriptions showed the same equivalent hydraulic conductivity for the modelled region as the field measurements. In addition, the models reproduce the observed hydraulic head-scattering along vertical boreholes. On the basis of the stochastic simulations of the fracture system some input parameters for the performance assessment of the planned repository were investigated. Calculation of flows into a planned disposal tunnel indicated that if the hydraulic conductivity of the material in the tunnel is the only variable parameter then there are two thresholds: under 1x10–9 m/s and above 1x10–5 m/s further change of the hydraulic conductivity does not dramatically affect the inflow. Abstract: The Ropianka Formation (also known as the Inoceramian Beds) in the marginal part of the Skole Nappe (Husów region, the Gaj section) contains abundant, diverse and well preserved assemblages of Maastrichtian planktonic and benthic foraminiferids, assigned to the middle-upper part of the Gansserina gansseri Zone and to the Abathomphalus mayaroensis Zone. The composition of the assemblages indicates fluctuations of organic matter flux to the marginal part of the Skole Basin floor in the studied interval. The studied taxa are typical of the “transitional zone” between the Tethyan and the Boreal domains. The disappearance of planktonic foraminifers in the uppermost part of the section and appearance of some agglutinated taxa (Rzehakina fissistomata; abundant Conglophragmium irregularis and Glomospira charoides) points to a Paleocene age. Abstract: Methods based on the Markov Chains can be easily applied in the evaluation of order in sedimentary sequences. 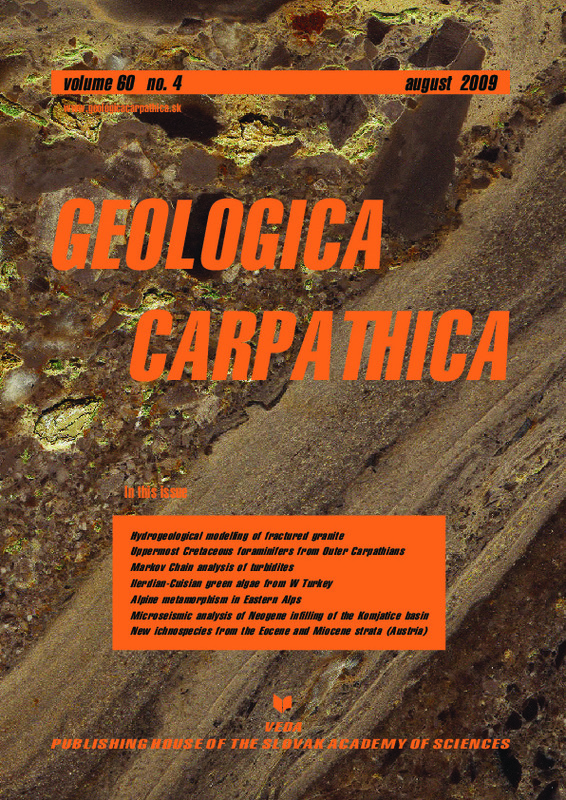 In this contribution Markov Chain analysis was applied to analysis of turbiditic formation of the Outer Western Carpathians in NW Slovakia, although it also has broader utilization in the interpretation of sedimentary sequences from other depositional environments. Non-random facies transitions were determined in the investigated strata and compared to the standard deep-water facies models to provide statistical evidence for the sedimentological interpretation of depositional processes. As a result, six genetic facies types, interpreted in terms of depositional processes, were identified. They comprise deposits of density flows, turbidity flows, suspension fallout as well as units which resulted from syn- or post-depositional deformation. Abstract: A new genus Anatoliacodium (Halimedaceae, Green algae) is described from the Ilerdian-Cuisian shallow-water sediments of Eskisehir region, central-western Turkey. These sequences consist of limestones, clayey limestones, sandy limestones and claystones. Anatoliacodium gen. nov. is characterized by erected calcareous segments with well differentiated inner structure: prevailing with large medulla of more or less densely set parallel filaments and cortical zone of prevailing horizontal to subhorizontal cortical filaments, once branching and without constriction. It is supposed that poorly and rarely preserved noncalcareous structures on the skeleton surface could be reproductive structures. The type species of the new genus is Anatoliacodium xinanmui gen. nov. sp. nov. A further new species is also described: Anatoliacodium merici gen. nov. sp. nov. Finally Gymnocodium nummuliticum Pfender, 1966 is emended and transferred to the genus Anatoliacodium. Abstract: The metamorphic pattern of the central Western Greywacke Zone (Austroalpine, Eastern Alps) was investigated by organic matter reflectance, Raman spectroscopy on organic matter and clay mineralogical methods. Raman data map a 10 km wide thermal aureole along the contact zone of the Greywacke Zone to the Penninic Tauern Window. The estimated maximum temperatures of 400 °C to 200 °C decrease from South to North, that is from the contact to the uppermost parts of the Greywacke Zone. This pattern is explained by an Oligocene to Miocene thermal pulse, related to the rapid exhumation of formerly deeply buried rocks of the Penninic unit. During this event, advective heat transport and circulating fluids overprinted the Cretaceous higher anchi- to lower epizonal metamorphic pattern of the central Western Greywacke Zone. Abstract: The microseismic survey method was applied to the study of the geological structures in the region around the Mochovce nuclear power plant. The previous geological and geophysical investigations considered a contact between the Miocene volcanites and sediments as a neotectonic fault. The results of the microseismic investigations allow us to interpret the zone of a supposed neotectonic fault as a transgressive contact of the sediments and the volcanic rocks without a tectonic disruption. Abstract: Gastrochaenolites hospitium isp. nov. is a domichnial boring showing the so-called false floors in scleractinian coral skeletons. The borings are semi-circular in mid-longitudinal section. They are produced by the mytilid Lithophaga (Leiosolenus) and keep up with further growth of their hosts for years. The false floors, being a retrusive equilibrium trace, are related to annual events.